Sign up your child in Grades 6-12 through Final Forms beginning Aug. 1. If your child requires an updated physical form turn it into your school's athletic office. Parents, please follow this link SPORTS REGISTRATION or go to the CPPS.ORGAthletic Page for Registration Access. View Immunizations requirements for students and download the physical form that must be completed prior to students playing sports. Contact the school nurse to learn about forms and procedures that you need to follow so your child can be provided medication while at school. The school nurse is Crystal Smith and can be reached at csmith@cpps.org. Starting in the 2018-2019 school year, CPPS will NO longer be participating in the USDA Provision 2 Program which offered FREE breakfast and lunch to all students. Below please find the pricing for school meals for the upcoming school year. *Students qualifying for reduced price meal benefits in these meal categories are not charged. Sign up to receive free or reduced-price meals in the online registration process or at the Registration Fair on August 9, 2018. Parents can prepay for meals and track meal purchases through their child's Online Payments account using their assigned ID and password. Parents of children not yet enrolled for school will receive their Online Payments login information once they register. View Davis school menus. View Sager & CPHS menus. Online Payments is an online portal where parents can manage their child's meal account, pay fees and fines. Your personal USERNAME and PASSWORD for Online Payments is the same as your Skyward Family Access USERNAME and PASSWORD. Please note these ARE case sensitive. This online portal is where parents and students can review grades and attendance, set up notifications for school news and emergencies, and more. Parents access their child's account using their assigned User ID and password obtained through the school. Parents of children not yet enrolled for school will receive their Skyward Family Access login information once they register. Forgot your password and login? Please contact your school. You can register your child for school online beginning July 1, 2018. College Place Public Schools will be hosting the annual Registration Fair on Thursday, August 9, 2018 from 8:00 am - 3:00 pm in the high school commons. Your child will NOT receive a schedule or a teacher assignment until they are registered. The CPPS District boundary map detailing your attendance area is available at all College Place Public Schools, the District Office and online at cpps.org. The District area is based on your street address. What documents do you need to register your student? Withdrawal sheet or report card and records from the previous school. Students entering kindergarten must be five years old on or before August 31. Prospective kindergartners should register at Davis Elementary School. Registration is typically the First week of April. For more information, please contact Davis Elementary at 509-525-5110. Parents can control how they are notified about school news and emergency alerts such as school closures and delays due to severe weather through Skyward Family Access. Log into Skyward using your child's assigned ID and password and click the Online Registration link on the left side menu. Click on the family Information tab on the right hand side of the page. Make sure that your current phone number and email address is listed in this section for alerts. If you don't know your Skyward Family Access login or your family is new to the district, contact your school office. View details about bus stops as well as rules for riding district buses through Transportation Services. Questions? Call Transportation at (509) -525-0246. The first day of school is Monday, August 27. View the 2018-19 school calendar. Each family receives a printed calendar from your child's school at the beginning of the year with important notifications. 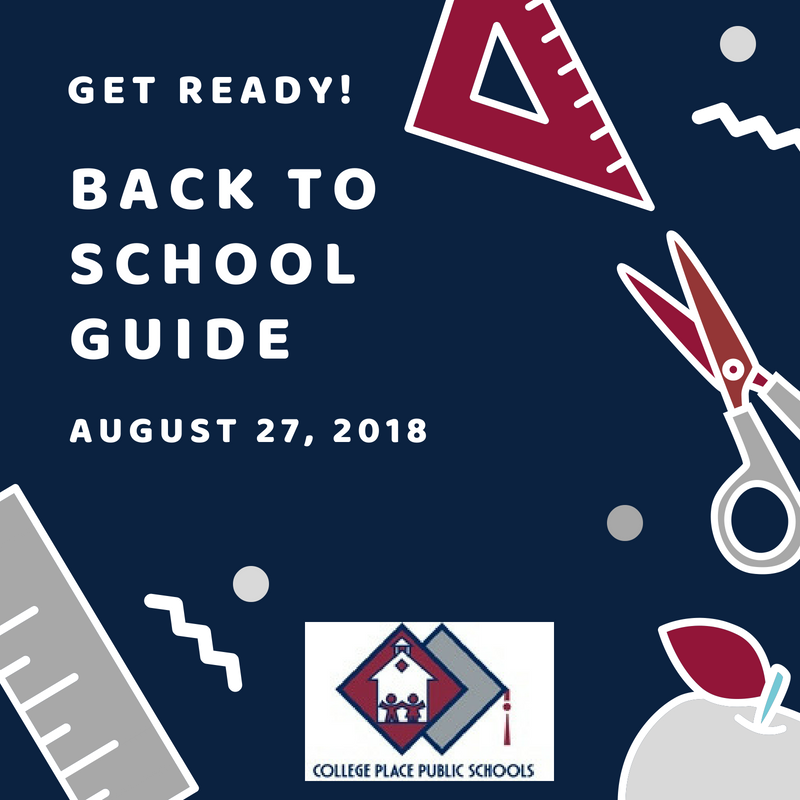 Davis Elementary school: 8:00 a.m. to 2:50 p.m.
Sager Middle school: 8:00 a.m. to 3:00 p.m.
College Place High school: 8:00 a.m. to 3:00 p.m.
Davis Elementary school: 9:00 am to 2:50 p.m.
Sager Middle school: 9:15 am to 3:00 p.m.
High schools: 9:20 a.m. to 3:00 p.m.
School list are located on the CPPS.org website for each school. Those students wishing to enroll INTO the College Place School District must follow the following process to be considered for enrollment in the current school year. The student must be released from their current district via their enrollment OUT process, Once the student has that paperwork signed by their current district, they need to come the College Place School District or the individual school to provide documentation of release and to fill out the enrollment paperwork INTO our District. There are several ways to get involved in your student’s school! Volunteer in the classroom, join the Davis PTA, the Sager PTO, or Boosters. Contact your student's school to find out just how you can get involved. Do you still have questions? Please feel free to contact your student's school or the District Office at (509) 525-4827.